Editor: Ted Calen Carpenter. Washington, D.C.: Cato Institute, 1991. 117 pp. $8.95. Reading the papers from a Cato Institute conference on "America in the Gulf," held on January 8, 1991 (that is, just prior to the beginning of the air war), is not very edifying. The editor lambastes President Bush for "leading a divided nation into war in pursuit of vaguely defined objectives that have little relevance to America's vital interests." William A. Niskanen declares that "a war against Iraq this winter would be the wrong war in the wrong place at the wrong time. Our government would make a tragic mistake in initiating that war." Richard K. Thomas argues that "there is no purely economic justification for opposing Saddam's takeover even of Saudi Arabia, let alone Kuwait." Gene R. La Rocque, a retired admiral, predicts: "If we attack, the only known result will be the ultimate defeat and possible occupation of Iraq at great cost to the United States." Is it bravery or foolishness that prompts Cato to publish these and like statements three months after the successful conclusion of Operation Desert Storm? The libertarian perspective has much to commend it; indeed, the free market approach to economic and political issues offers intellectual excitement for our era that parallels that of socialism a century back. But when it comes to foreign policy, too many libertarians purvey warmed-over leftist bromides. Why so? Simple. Just as Leftists oppose U.S. foreign policy because they oppose what America stands for, libertarians oppose U.S. foreign policy because they oppose Washington and what it stands for. Put differently, they see Washington messing things up with Nazi Germany and Iraq just as it does with New Hampshire and Virginia; and they mistakenly count on free markets to solve non-economic problems. 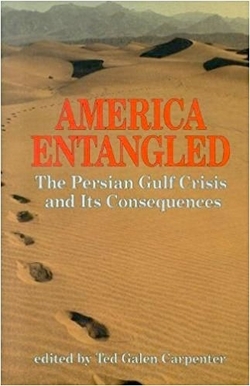 Daniel Pipes's brief review (Fall 1991) of America Entangled: The Persian Gulf Crisis and Its Consequences grossly misrepresents both the content and the purpose of this book. The purpose of the conference at which the papers in this book were presented was to avoid a war that we expected to be successful, but believed to be wrong. The purpose of the book was to make our reasoning available to a larger audience in the hope of shaping views about U.S. national security strategy in the post-cold war era. An expectation of success is a necessary but not sufficient condition for initiating a war. All of the authors of these papers expected that a U.S. war against Iraq would be a military success. The United States would probably now prevail in a war with any nation, but that does not help identify where or when a war would serve our national interest. Our opposition to the Gulf war was based on a reasoned analysis that it was not in our national interest, not that we "see Washington messing things up." Moreover, even in a retrospect, the dramatic military success of Operation Desert Storm should not be a sufficient defense of the Gulf war. Pipes's question whether it was "bravery or foolishness" that led Cato to publish this book reflects a failure to distinguish between the effectiveness and the value of a government activity. Finally, I challenge Mr. Pipes to identify any statement in the book that would be accurately described as a "warmed-over leftist broadside" or that proposes to "count on free markets to solve non-economic problems." Conservatives and libertarians differ on a number of issues. Cato has tried to resolve these differences by reasoned analysis and evidence. Pipes's brief view, in contrast, relies on innuendo to dismiss a position with which he disagrees. William A. Niskanen, chairman of the Cato Institute, has three complaints. The first is that I grossly misrepresented the content and purpose of America Entangled, which he believes to present a "reasoned analysis" that war with Iraq "was not in our national interest." Not so. The first paragraph of my review deals with the book, and key direct quotations make up more than half the text. I cite four authors (Ted Galen Carpenter, Richard K. Thomas, Gene R. La Roque, and Niskanen himself), all of whom make exactly Niskanen's point, and more colorfully than I could ever bring myself to do. Where's the distortion? Secondly, Niskanen says I confuse a successfully fought war with a war fought in the U.S. national interest. I do not: in writing that the war was successfully concluded, I was referring not just to military matters, but also to the evident truth that Kuwait had been liberated, Iraq's weapons of mass destruction mostly eliminated, a threat to the international economy relieved, the U.S. government's credibility validated, and the new U.S.-Soviet relationship tested and strengthened. The Cato Institute's refusal to recognize these successes prompted the critical tone of my review. In his third complaint, Niskanen takes exception to my statement that "too many libertarians purvey warmed-over leftist broadsides" when dealing with foreign policy and challenges me to find evidence in America Entangled. The book is replete with such left-wing assertions. But my comment was about libertarianism in general, not the book in particular, and this is a subject worth some attention. On foreign policy issues, libertarianism has two strands: the isolationist and the muscular. The Cato Institute and the Libertarian party represent the former, Ayn Rand and Milton Friedman the latter. Reason magazine straddles the two. Muscular libertarians generally adopt positions similar to conservatives, but their isolationist colleagues do indeed espouse views closely resembling the Left. And not just the Left, but the far, far Left. Niskanen already knows this. He was one of eleven signatories of a letter which ran in the October 29, 1990, issue of The Nation stating opposition to war with Saddam. My question is: Why did these eleven figures, most of them distinguished libertarians, send such a letter to The Nation, the last significant bastion of Marxian mumbo-jumbo in the United States? To me, this letter says: Look, we agree with you on this issue, so let's work together. Such cooperation can, of course, be explained by tactical convenience. But substance too is involved. As chairman of the Cato Institute, Niskanen is also the publisher of "Ancient History", an extraordinary document. Written by Sheldon L. Richman, a senior editor in his employ, "Ancient History" is a nearly book-length study tracing four decades of U.S. policy in the Middle East. It begins with the author acknowledging an "immeasurable intellectual debt" to Noam Chomsky. Chomsky, for those who may be unaware, is very possibly the most frenzied and obsessively anti-American analyst writing today. Nor is the reference to Chomsky an aberration; throughout the work Richman draws on a host of leftist revisionists and extreme-left writers to support his arguments, including Edward Said, Christopher Hitchens, Joe Stork, Livia Rokach, Simha Flapan, Gabriel Kolko, and Jonathan Kwitney. The piece is leftist in detail, too. Keeping with leftist orthodoxy, for example, Richman disparages the Soviet threat ("it is doubtful that the Soviets ever had the kind of influence in the Middle East that the ideological cold warriors believed") and portrays Washington as a tool of avaricious business interests exploiting poor peoples around the globe (U.S. strategy "saw the Third World as a source of raw materials and a market for finished goods, but only under the direction of pro-American, even if brutal, rulers"). This exactly echoes the view of the "national security state" and American corporate capitalism produced over the decades by such far-leftists as Chomsky, Seymour Melman, Marcus Raskin, Richard Barnett, and Ernest Mandel. Moreover, "Ancient History" is suffused with an animus indistinguishable from common left-wing diatribes against the U.S. government and its foreign allies, whether Iran under the shah or, especially, the state of Israel. Indeed, Richman's footnotes provide a who's who of anti-Zionist polemicists. Taking the twentieth century as a whole, the single most warlike, most interventionist, most imperialist government has been the United States.... [In contrast,] the Soviets arrived early at what Libertarians consider to be the only proper and principled foreign policy. With this approach, it is not surprising that libertarians joined forces with the Left to defeat the contras in El Salvador and condemned the Grenada invasion as "senseless militarism." If this is not a record of warmed-over leftism, what is it? A final thought: The Cato Institute does creative and valuable work on economic questions; if not yet part of the Washington mainstream, its voice is increasingly respected. Why then does it flaunt this affinity for the fringe Left on foreign policy issues? Why reach out in solidarity with The Nation and boast of intellectual debts to Noam Chomsky? What has this to do with the spirit of free markets and free minds that inspires the best of libertarian thinking? William Niskanen has not asked me for advice, but here is some anyway: Stick to the economic analyses you do so well and leave foreign policy to others.